Dubai Crane is one of many subsidiaries of Dubai Investments PJSC a public company with capital of a total asset value of AED 14.745 billion (USD 4 billion) and diverse interests. The 47 companies in the Dubai Investments portfolio span activities such as building, development, glass, technology, plastics, pharmaceuticals and food. The UK’s largest factory crane manufacturer, Street Crane operates globally via a network of over 60 high quality local trading partners. Dubai Cranes LLC and Street Crane Company of the United Kingdom have concluded an agreement under which advanced design factory cranes will be available to manufacturers in United Arab Emirates on short lead times. Dubai Crane are to carry a substantial stock of Street’s crane kits that will be used with locally fabricated structural components to meet lifting needs of up to 300 tonnes. Street Crane will share technical expertise with Dubai Crane so that major crane structures such as gantries and crane beams can be fabricated to UK and European standards in Dubai. These structures will then be mated to electro-mechanical systems such as end carriages, carriages, hoists, controls and electrical gear supplied by Street Crane from the UK to create advanced world-class cranes. Stock holding by Dubai Crane will facilitate prompt delivery for main market cranes of single or double girder construction up to 25 tonnes safe working load and up to 30 metres span. In addition, technical collaboration allows the companies to undertake major complex infrastructure projects. A recent collaboration was a new facility for Emirates Aluminium, (EMAL) where more then 15 special overhead cranes were installed as part of the multimillion US dollar investment. Cranes with capacities from three to 50 tonnes were installed with several cranes having auxiliary hoists to assist in the tipping of ladles. 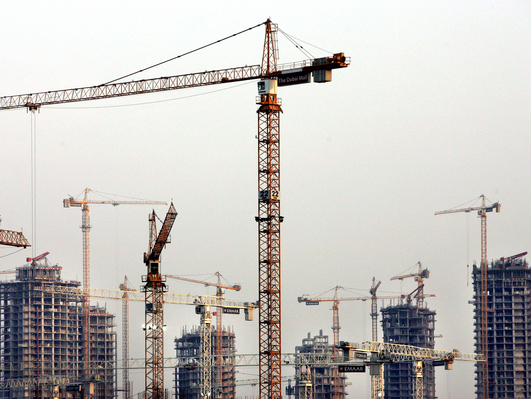 All the cranes were designed and engineered for intensive 24/7 operation in a harsh environment. Speaking for Street Crane, managing director Andrew Pimblett commented. “We are delighted to be working with such a high profile and well resourced local partner. Local fabrication of major crane elements not only provides a more responsive service for end users, but also creates value in the local economy, so that this is a win-win for all the project partners.